narrator sounds like he's channeling the author, not just praying the text! But the thesis is well considered and carefully presented, making it valuable overall, particularly in the leading 4/5 of the book. There is a certain cultural and geographic myopia of author perspective---yet it comes across as authentic much more than proscriptive. 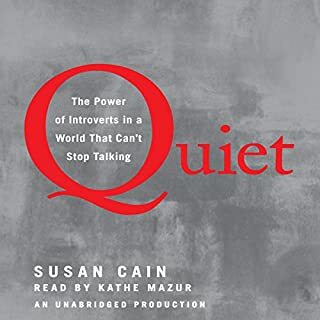 I really enjoyed most of the book's case for quiet power. The narrative presentation has a tension between cited research and the framing of journalism. I listened at 1.5x so the performance got tuned a bit toward urgency, and that emphasised the narrative tension and also made have made audio edits more noticeable.